Dr. Priyanka Yadav is a trusted Gynaecologist in Sector-31, Gurgaon. She has over 21 years of experience as a Gynaecologist. She studied and completed DGO, MBBS, Fellow of Indian College of Maternal & Child Health (FICMCH) . She is currently practising at Gynae Clinic in Sector-31, Gurgaon. Don’t wait in a queue, book an instant appointment online with Dr. Priyanka Yadav on Lybrate.com. 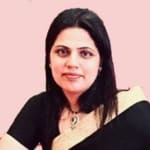 Lybrate.com has a number of highly qualified Gynaecologists in India. You will find Gynaecologists with more than 31 years of experience on Lybrate.com. Find the best Gynaecologists online in Gurgaon. View the profile of medical specialists and their reviews from other patients to make an informed decision.